Plans have been announced that aim to bring in a cap to energy prices, but what does this mean? The draft legislation outlines how energy regulator Ofgem will gain power to cap tariffs known as 'Standard Variable Tariffs'. Unlike a fixed rate tariff, variable plans allow for prices to rise, and fall, depending on the changing market rates. There are currently around 12 million households on a variable tariffs, and while it can work to your benefit when prices drop, there are currently no restrictions in place as to when these prices rise and you could face paying some very large bills. 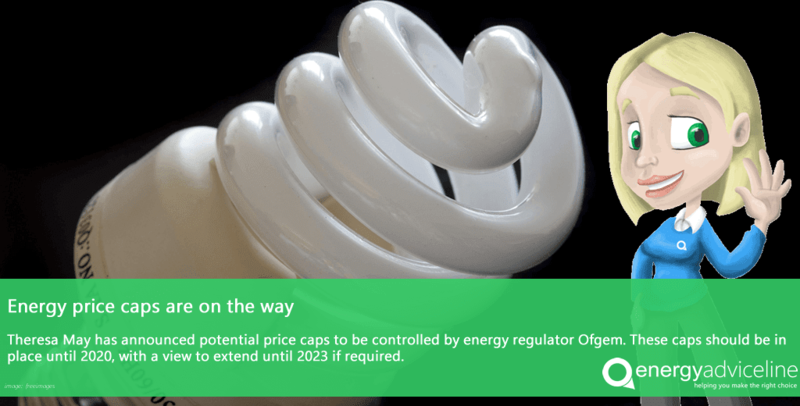 Experts say that it is unlikely this price cap will come into force before the winter, but it is currently slated to last until 2020. Ofgem will also have the capability to extend it until 2023 if it decides this is necessary. This cap won't affect all tariffs; pre-payment meters and green tariffs are exempt. Julian Morgan, managing director of price comparison service Energy Advice Line, commented, "We're interested to see these caps come into place, and find out how it's going to properly affect the market. It's hard to say at this point in time how companies are going to react, but the chances are that the rates for these tariffs are most likely going to rise. "The only way to get the best price for your energy, and save money along the way, is to check the market and see what options suit your usage - don't move to a capped tariff just because you think it's the right thing to do." Energy Advice Line provides a free, no obligation quoting service that allows your business to check out the latest rates on the market and find the best price for your needs. Head to energyadviceline.org.uk to find out more and start saving today. The Energy Advice Line has spearheaded a campaign for the energy regulator Ofgem to ban the practice of cold calling because it placed undue pressure on consumers to agree to energy deals that were not necessarily the cheapest available. "Although this case related to automated calls, it highlights the lengths that some companies go to to pressure consumers to buy their product or service," Mr Morgan said. "We firmly believe that truly independent and reputable price comparison and switching services should not resort to unsolicited telephone calls. In awarding the record fine, the Information Commissioner rightly described nuisance calls as a 'modern pest'. "Chooseing an energy supplier is a cruical decision because a bad choice can cost a household or business hundreds of pounds, or even more in the case of large organisations. "Consumers need time to consider their decision and not be placed under pressure during an unsolicited telephone call." Mr Morgan said he was aware of cases where consumers had been called, repeatedly, in once case while they were attending a funeral, by unscrupulous energy 'brokers' using heavy pressure sales techniques to force them to agree to an energy deal. He said in many cases these cellars were not independent, despite their claims to the contrary, and were often calling on behalf of a single energy supplier and therefore not necessarily offering the cheapest deals. 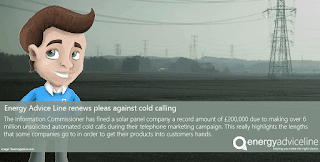 "We would like Ofgem or the Information Commissioner to investigate the practice of cold calling by energy suppliers and the third parties they sometimes engage to do it," Mr Morgan said. "Consumers need to take control of their energy supplies and shop around to find them the best deals, and switch accordingly. "Truly independent and reputable services like the Energy Advice Line would never engage in cold calling because we don't need to. Consumers trust us to help them shop around and we never pressurise them to make a decision. "Unfortunately not all suppliers or price comparison services take the same view and consumers need to be protected from them."